New cycle of activity of the Sun and how it influences the Polar light? For most of people the Sun is just very bright object in the sky. In the Sun there really are all the time difficult processes which have an impact on our life on Earth. What is cycles of activity and as it influences the Polar light? We enter a new cycle of activity! At the end of November, 2018 there were First signs which speak about approach of a new 25th cycle of solar activity. Such signs are magnetic fields with other orientation different from that that it was observed the last 11 years. Possible magnetic fields of a new 25th solar cycle. 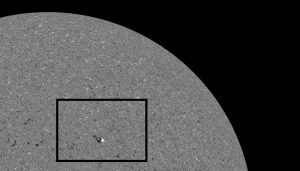 The photo is received by the HMI telescope on the SDO satellite of 08.11.2018. It means that at fast development of the scenario in the second half of 2019 there can already come the following 25th cycle of solar activity which will last about 11 years. In the Sun there will be spots again and the number of flashes will increase. It will provoke growth of geomagnetic storms and polar light on the earth. On the first months of observations of the expected activity it will be possible to draw a preliminary conclusion how abrupt the curve of growth of activity and what of scenarios of future cycle is implemented is. However, some of these scenarios assume the beginning of the new Maunderovsky minimum meaning freezing of the mechanism of solar cycles for decades. How falling of solar activity is reflected in weather and climate? Falling of solar activity provokes decrease in a stream of the energy arriving to Earth and at the same time increase in a stream of space beams which in turn lead to increase in ionization of the atmosphere. It leads to increase in a zavikhrennost and essential weather anomalies in midlatitudes (strengthening of meridional transfer of air masses), and also increases overcast and thus increases albedo, reduces intensity of evaporation, leads to droughts, increase in quantity of extreme weather events and unpredictability of weather and. etc. All this leads to increase in damage from extreme weather events (of course, weather and climate are influenced by not only solar activity, but also other factors). The fact that, infrastructure, especially everything, as for agriculture, is not ready to such changes guards. At the same time both economy and society in general. In this regard both ordinary inhabitants, and various industries need to adapt and adapt to such changes which in the future, perhaps, will be only more. Next post: Holiday of Spring in China!